Lock in a great price for Casa Morella – rated 8.6 by recent guests! The location and hosts are outstanding. Highly recommended. We were made to feel at home from the moment we arrived until we left. In fact we stayed chatting with the hosts, David from Scotland and his wife from Russia for an hour after check-out. The views from the casa of the town with the castle and church on top of the hill are picture postcard! We would definitely recommend Casa Morella! The place is very clean, has a fantastic view and, on the top of all, Dave was very welcoming and gave us great advices. Thank you! Excellent location. Big house with plenty of parking which is rare in this location. A very short notice booking, same day. David couldn’t have been more helpful from sending directions ( which you should pay attention to as it wouldn’t be easy to find without) to a meet and greet with tea and an upgrade for me to a whole apartment ! Shame I was only staying one night. This is now on my short list and if ever I’m passing close I’ll be sure to see if there’s room for me again. David and Ia were the best hosts you can wish for! They are very friendly people and in for a good laugh and chat! The view is incredible and they help you around if you need to know something! The house located in a quiet and peaceful area. At the same time it gives you an outstanding view of town that stands up on a hill. This place can be a good base for exploring both the local area and region as a whole which are quite unique. The hosts Dave and Iia were very hospitable and kind, they gave us a lot of interesting and helpful information and it was a great pleasure to talk to them. We wish we could stay much longer! Very friendly guests, helping us to visit Morella with useful hints. The view to Morella under the morning sun is magnificent. The owner was very friendly and helpful. But the place was difficult to find as it has no address and no sign outside. The Location was a lot better than we expected, very quiet and Morrella is a lovely & historic location. The hosts David and Iia were smashing both before and during our stay. One of the few places we have stayed at where pet friendly means just that (not just pet tolerant at a price, like other hotels we have stayed at! Booking.com take note) We loved the fact that we had the use of a kitchen as well. Era un escocés muy amable y atento. Nos dejó la mejor habitación que tenia porque la tenia disponible y se lo agradecemos de verdad. 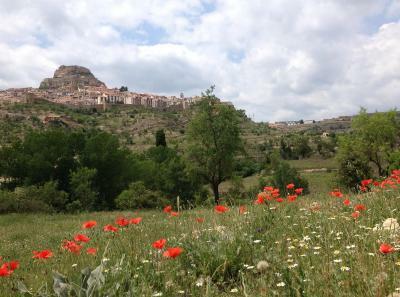 This rural house just 1.2 mi from Morella, north Valencia, offers wonderful views of the town. It offers apartments and rooms, which have access to a shared kitchen, and there is free internet access. The apartments have a bedroom and a lounge area with satellite TV and a private kitchen. The rooms all have central heating, and either a shared or a private bathroom. There is a garden with a children’s play area and a barbecue. 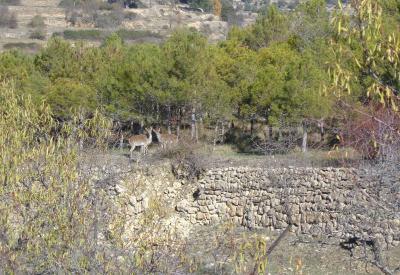 The area is ideal for hiking and cycling. 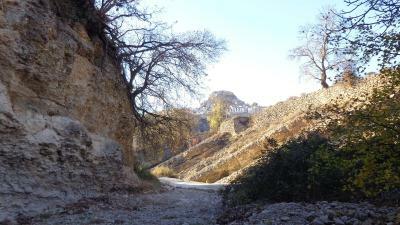 Local sights include the towns of Mirambel, Cantavieja and Iglesuela del Cid. When would you like to stay at Casa Morella? House Rules Casa Morella takes special requests – add in the next step! Please let Casa Morella know your expected arrival time in advance. You can use the Special Requests box when booking or contact the property. I didn’t like the path between the house and the main street. It should be improved a littler bit. David was really friendly friendly and nice. Would have liked a slightly bigger bed but this was no "big deal" and either air con or at least a fan would have been welcomed although it did cool down during the night. The bed wasn’t long enough as it had an old fashioned board at the end. No breakfast available. Would have liked it if the larger bed had more than one pillow. Dave was very welcoming and kind.